The whole time I was playing BoxBoy! I was just waiting for it to turn into the game it kept threatening to turn into: one that actually combined all of the various mechanics I'd been learning so far and made levels that used them all together. For some reason, though, the game just refuses to the whole time I'm playing it, until I suddenly found myself at a door that said "Final Level." That didn't seem like it should be right, but I went in and finally, finally found the game I'd been wanting the whole time! The mechanics had all combined and the puzzles finally became as tricky and clever and involved as I'd hoped they could be. I had that moment where I put the game away and then suddenly went 'of course!' as the solution popped fully formed into my head. I would rush back to the game and success, oh sweet success, it worked and I was through! And then the credits rolled. But don't worry, guys and gals! It's Nintendo! At this point credits are just the START of the game! And this brings me to my next topic, that we really need to talk about this issue. Come on, let's invite all of Nintendo's closest friends and have a little intervention. We're all here today, Nintendo, because we love you and care about you. But lately you've had this issue where... you hide your clever game design behind collectibles and hours of more simplistic gameplay. I know you think you're helping people, I know that! And it's important to help people understand a game before you really give them challenges! But remember the old days, of games like Punch-Out! and F-Zero GX? People loved those! Why did you change like this?! Because for some reason Nintendo's started to dive really hard into this design idea, that the REAL gameplay is in some way hidden, only making itself available to those who put up with other stuff. It's how you wind up with people having to say about their games, "Oh no it only REALLY starts when the credits roll" or "did you collect all of the _____? That's when the game really shines!" or "no no, it's only incredible when you play it like this!" BoxBoy! just winds up being the latest game to follow that pattern, where I have to allocate part of this review to saying "ok wait until after the credits!" because then the levels actually DO get really hard and tricky and fun and actually tickle your brain. From a game where I only had problems with one or two levels taking over a minute, to one where a single puzzle in a stage will take 5 minutes of trying and failing to get through. Where you have to think of the shape of the boxes now, and then 4 steps from now as well. In short, it goes from a good distraction to a really fun puzzle game. 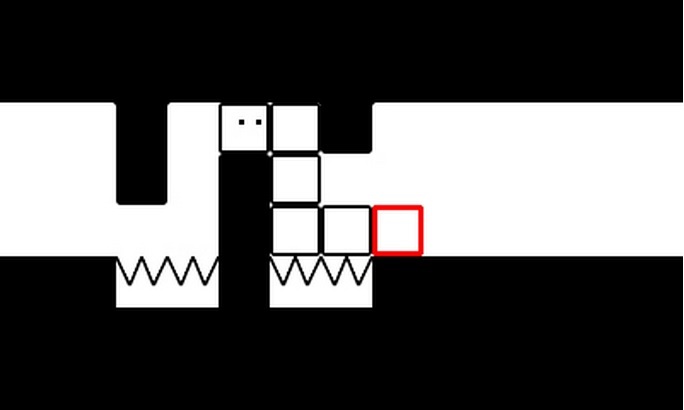 As the titular Box Boy (who I made wear the 'rapper' gear, so that I start to think of him as Beat Box Boy, though he's actually named Qbby), you can create boxes from your body, which stick to you until you let go. Each level has a limit for how many, stretching from as low as 3 to sometimes as high as 9 (I didn't even know what to do with that many boxes! ), and from there the game builds its mechanics, layering new things on. Each of the first 16 worlds introduces a mechanic and then focuses on it until the world is over, then sort of abandons it. The only ones that stay in the game are things like snaking (you can zoom over to the furthest box from you that won't make you fall) or ledge hanging, which ties into snaking. From these basic things comes a challenge slowly layered on. And slowly. Like I said, it was 16 worlds before I got to a level that actually combined things from previous areas to make something, well, more. It's cool that the previous areas acted as sorts of tutorials, but they never really give much of a challenge until the end. Adding to that feeling of ease is that there's an ever-present hint option at every puzzle. It doesn't show you how to get the collectibles, but it does give you a solution to a puzzle for the price of one of the StreetPass coins in the system. That's all! 20 steps and you get a hint, and there's no penalty to them. It's a really easy way to help you through. After finishing the game, and the, ah, story as it were, you then unlock more levels that are much more difficult. To add some length to the game you can also purchase (in-game currency, not real money!) time and score based trial levels. And while I won't call the early game a slog by any means, it's 17th world and the post-credits ones that really make the game something really worth talking about. Nintendo needs to stop hiding the best parts of the game like this, because it makes it so that I have to assure people much more that no, you just have to keep with it for it to be something GREAT. It's a silly and difficult to understand design decision, but when you get there, it turns an already fun game into a fantastic game. So guys, get BOX BOY!. It's fun, but if you really stick with it, then it turns into something a lot more challenging and enjoyable. If you haven’t experienced the BoxBoy! series and can only pick one, Bye-Bye BoxBoy! has the most variety, providing the most value. Otherwise, picking up the whole trilogy is a great solution for anyone seeking ingenious portable puzzles in bulk. Bye-Bye, BoxBoy! We’ll miss you!